Beginning stages of a Landscape Architect drawing. How much does the drawing cost? If you are having them design the entire yard. You want another company to do the installation. You live in a city that requires an architect rendering. The drawing has to be submitted to the city until they reach final approval. Just ask, it’s the only way of knowing. As with most services rendered, the answer is often yes. That being said, it can still vary depending on companies. Also, while many companies will send you an invoice for the balance of the service, others may require payment in full when the job is complete. Check with your designer to see what their company policy is. 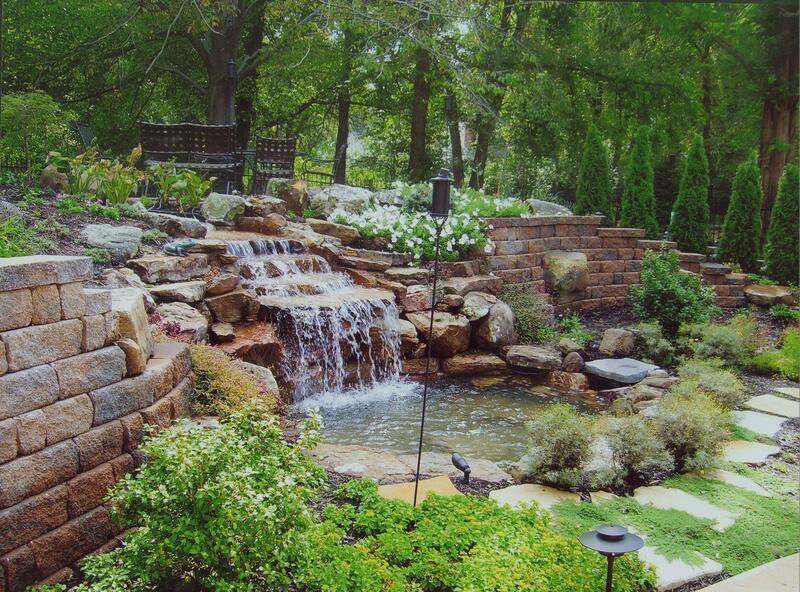 Backyard retaining wall with waterfall and pond. At this point, the designer will go back to the office and, well, design! When they have completed the drawing, they’ll pass it off to the graphics design team who will make it look pretty and legible. The company will then put together an estimate, have the designer give his final approval and off it goes to you. How do I know what anything looks like? Take a trip to the garden center. 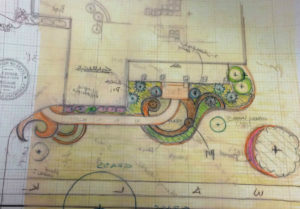 Most designers will meet you at the garden center once the drawing is complete to look it over and walk through the plant material. As you go over the plant material, let the designer know if you see something on the drawing that you don’t like. They can then find a suitable substitution to replace the item. 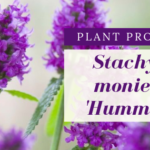 Take the trip to the garden center – it’s worth it! Stepstone walkway in a perennial garden. Um, what if I don’t like it? It happens. 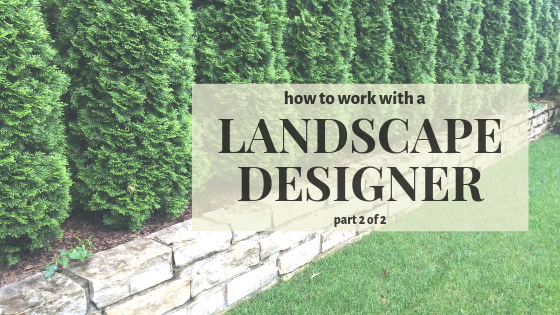 Ultimately, it’s your home and your landscape so tell the designer and they will work with you to make the appropriate changes. Planting large trees too close to the home – these can cause serious foundation issues over time. Huge no, no. Not wanting to spend any of your budget on drainage when it’s recommended by the designer. Water going into your house = bad. Water going away from your house = good. I get wanting more bang for my buck with all kinds of pretty flowers (who wants to spend money on something no one sees?) but you’ll save waaay more money by doing it right the first time…trust me. I could keep going but I think you get the picture. Basically, you are working with a designer for their knowledge – use it! Now you get to see the project set in motion. 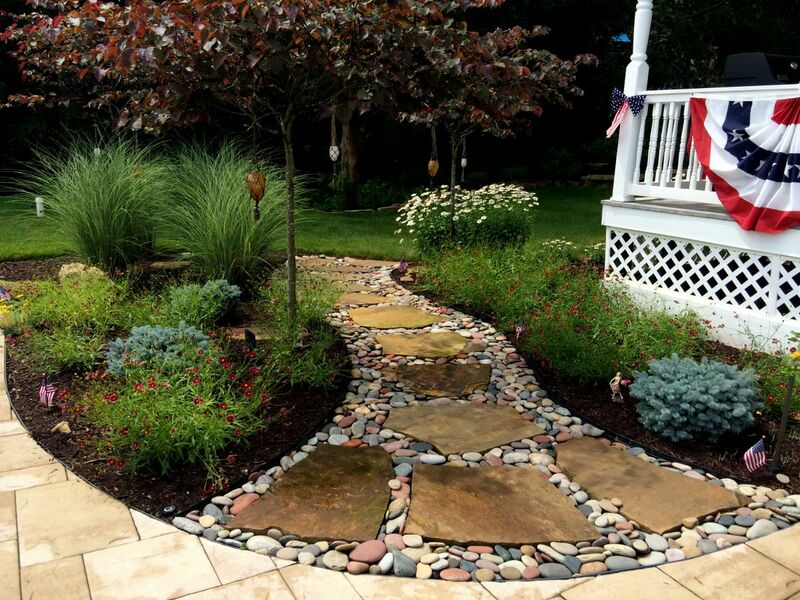 If you are installing a front landscape with no edging or walls, the job may only take a few days. 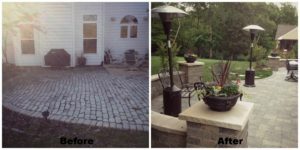 If you’re installing any hardscape, be prepared for a bit of a mess and a job that takes longer. Patios and walls are dependent upon their base structure which is where much of the time is spent. Once the foundation is complete, the project will move relatively fast until completion. 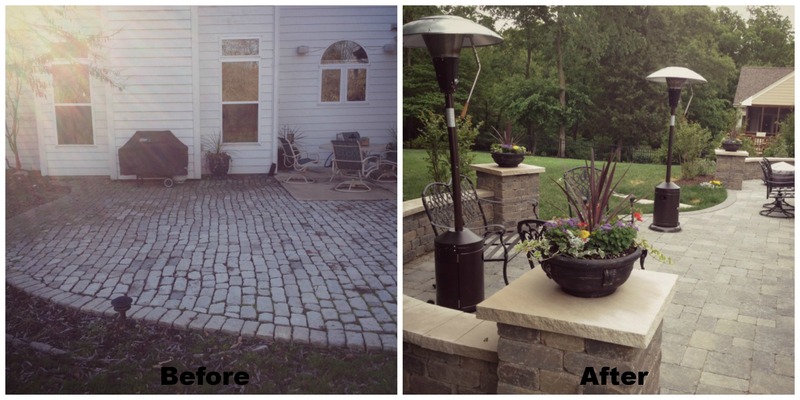 Backyard patio before and after. The job is finally complete. All your hard work and planning has finally paid off! It’s the time to have a big garden reveal party (why aren’t these a thing??) or simply sit back with a bottle of wine and admire the beauty. Do you live in the St. Louis area and are ready to start your landscape project? Give us a call at 636-532-1033 or go HERE and we’ll contact you!